Related Series: A whole host of additional material, including ten movies and more specials than I could reasonably list here. Also Recommended: The other two in the Holy Shounen Trinity: Naruto and Bleach. If you love a strange shounen series, JoJo's Bizarre Adventure is a great choice. Notes: Based on the extremely popular manga by Eiichiro Oda. The anime as consistently ranks as one of the most watched series in Japan. As of late 2013, this series is still being produced; this review is based only on the first 450-some episodes. It all started when the King of the Pirates, Gol D. Roger, was publicly executed. He was said to have accumulated unimaginable wealth during his journeys, and when asked by the mob where he hid his treasure, he said: "You can have it if you find it. I have hidden all of it in one piece!" His final words inspired a surge in piracy, as men took to the seas eager to hunt down the treasure and claim the mantle of the Pirate King for themselves. The Age of Piracy has begun! ... that a perfectly natural reaction from someone who hasn't seen this series, or has seen some of it and didn't care to continue, is skepticism. After all, I'm talking about a cartoon about a rubber pirate who acts like he's five years old. It's essentially just another shounen fighting series for 11-year-olds; it hardly seems like the Citizen Kane of anime. Hyperbole in the name of exuberance can have the odd effect of putting people off, and spending over hundred hours on anything requires a lot of exuberance. That skepticism is understandable, especially since explaining what makes this series work might not sound all that different from why people enjoy Bleach, Naruto, or similar series. So let's start with something we can all agree on- visually and conceptually, One Piece is a unique series. Anime is littered with ghost hunters, ninjas and teenagers endowed with mystical powers inspired Eastern mythology, but Oda hit on something special when he came up with the idea of 17th century pirates with superpowers. And that's really the beginning of One Piece's creativity. For such a long series, a constant flow of creativity is a must, and Oda has generally shown that he is up to the challenge. One of the conceits of the series is that each island the characters travel to is a strange world unto itself. One island could be under the thumb of tyrannical mermen, another a mystical island where it always snows, and still another where all the plants and animals have grown to be really l o n g. It's wonderful world building, but not in the sense that it's carefully crafted like Fullmetal Alchemist. It's more like a child's glee at making things up as she goes along. Unlike most shounen series, where superpowers and wonders have some kind of pseudoscientific explanation, the series follows an unrelenting dream logic that it doesn't explore very deeply. Why does eating a fruit that gives you superpowers also mean you can never swim? It just does, dammit. It's a refreshing change, and it keeps the sense of wonder intact for many episodes. Take the superpowers our heroes wield. Luffy is a kid who ate the Gum Gum Fruit, and now is a rubber man: literally, a man made of rubber. That sounds like the start of a bad joke, but in One Piece, it's a potent power that leads to some crazy, awesome, and crazy awesome fights. He can take a lot of damage, and since his rubber fists and feet can stretch to huge lengths, he can give as good as he takes. One of the main villains, Buggy, ate the Chop Chop Fruit, so he can divide his body however he pleases. And there are many more, and for over three hundred episodes, we are constantly introduced to wave after wave of new characters with strange abilities that range from the silly to the sinister, and, sometimes, are even both at the same time. And one of the small delights of the series is that when our heroes get strong by developing their powers, they break from the shounen formula of "defeat - training - victory." No, the characters develop their skills on the fly- they make it up as they go along. This burst of creativity lasts so long and is so strong, that when the anime does finally bring back some old characters beyond the core cast, it's a bit of a disappointment. Of course, for the series to be any kind of success, these characters would have to be better than your garden variety heroes. They'd have to be characters you could care deeply about and watch develop beyond what crazy things their powers do. Luffy can't become the Pirate King by himself, so he brings along a ragtag group of people he befriends in his travels. Though the small crew keeps adding new characters, there's roughly five core members: Luffy, Zoro, Nami, Usopp, and Sanji. While you could safely describe each of these characters by whatever their particular kook is- Sanji is the cook who loves the ladies, Nami is the domineering navigator who loves money, Zoro is the samurai swordsman who wields three blades and sleeps all the time, Usopp is the sniper who tells outrageous lies- but that doesn't quite do them justice. They develop and grow close to each other, reinforcing the anime's central theme of friendship. The cast is probably One Piece's greatest strength, because when the story lags and things slow down, it's still a pleasure to spend time with the Straw Hats. I would hold them up to any of the great crews of anime, from Lupin, Urusei Yatsura, or Cowboy Bebop. And save a kind word for the villains: after all, what's a good hero without one or a dozen great enemies? They are all hateful bastards who deserve to get their face smashed in. It's a delight to see it happen every time. The concept of One Piece is very open ended; "Boy tries to be the Pirate King" leaves a lot of room open for how that could happen. Appropriately enough for a series about a long odyssey, the series has been leisurely working its way towards an ending. So far, the anime has covered about five major story arcs, some of which have several mini arcs. It starts out with short, mostly silly stories that are quickly resolved, but as we get to know the characters more and the world opens up, it gradually, confidently builds towards high drama with some epic storylines. Two examples stand out: the Alabasta Arc and the CP9 Saga. The Alabasta Arc starts shortly after the core of the crew is assembled and spans over fifty episodes. It's a big, meaty storyline with conspiracies and secret identities, rebellions and politicking, and has one of the most effective villains I've ever seen in anime. It's only topped many episodes later, with the epic CP9 Saga. This one spans a hundred episodes and is a more emotional viewing, and it's where the Straw Hats show the most growth. I really mean it when I say One Piece has the elusive "spirit of anime." As a series, the serialized storytelling has a lot of impact that builds from episode to episode, and shows extensive planning for arcs a couple hundred episodes in advance. It's one of the few series that can only be realized in animated form, and it has so much impact because of its extreme length. And it may be nowhere near finished. 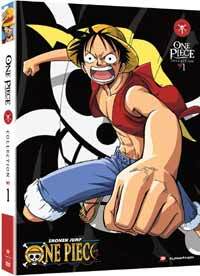 When recently asked how close the manga was towards completion, which the anime sticks very close to, Oda estimated that he was about halfway finished. And while he's known to be a jokester in interviews, I don't know of any reason not to take his answer at face value. And while recent episodes haven't quite lived up to the same level as earlier, since Oda has started to dip more often into the pool of Shounen Jump cliches, it says a lot that my reaction to this news was happiness. Recommended Audience: Despite the lack of blood, the series can surprisingly brutal. Characters also drink and smoke, which may have been enough to send 4kids into an editing frenzy, but overall, it seems fine for preteens and up. Version(s) Viewed: Region 1 release from FUNimation when available, digital digital source when unavailable.